Peer teaching is not a new concept. It can be traced back to Aristotle’s use of archons, or student leaders, and to the letters of Seneca the Younger. It was first organized as a theory by Scotsman Andrew Bell in 1795, and later implemented into French and English schools in the 19th century. 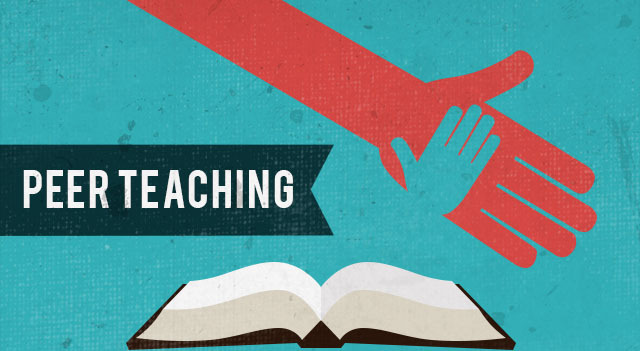 Over the past 30-40 years, peer teaching has become increasingly popular in conjunction with mixed ability grouping in K-12 public schools and an interest in more financially efficient methods of teaching. Not to be confused with peer instruction—a relatively new concept designed by Harvard professor Eric Mazur in the early 1990s— peer teaching is a method by which one student instructs another student in material on which the first is an expert and the second is a novice. Goodlad and Hurst (1989) and Topping (1998) note that academic peer tutoring at the college level takes many different forms. Surrogate teaching, common at larger universities, involves giving older students, often graduates or advanced undergraduates, some or all of the teaching responsibility for undergraduate courses. Proctoring programs involve one-on-one tutoring by students who are slightly ahead of other students, or who have successfully demonstrated proficiency with the material in the recent past. Cooperative learning divides classmates into small groups, with each person in the group responsible for teaching others, and each contributing a unique piece to the group performance on a task. Reciprocal peer tutoring (RPT), a more specific version of cooperative learning, groups classmates into pairs to tutor each other. Students receive more time for individualized learning. Direct interaction between students promotes active learning. Peer teachers reinforce their own learning by instructing others. Students feel more comfortable and open when interacting with a peer. Peers and students share a similar discourse, allowing for greater understanding. Peer teaching is a financially efficient alternative to hiring more staff members. Teachers receive more time to focus on the next lesson. Research also indicates that peer learning activities typically yield the following results for both tutor and tutee: team-building spirit and more supportive relationships; greater psychological well-being, social competence, communication skills and self-esteem; and higher achievement and greater productivity in terms of enhanced learning outcomes. Various peer teaching programs have cropped up at universities around the world in the past few decades, promoting the notion of peer-assisted learning. Nearly every institute of higher education in the world provides peer tutoring opportunities for struggling students and teaching assistant positions for advanced students. Students in the Advanced Chinese Studies program, Intensive Chinese Language program, and Summer Intensive Chinese Language program at Peking University (PKU) in Beijing are required to meet for a minimum of three hours per week for one-on-one sessions with their Chinese language tutor. The Peer Language Tutor program at PKU is a unique hallmark of these programs that help ensure its students’ linguistic and cultural fluency progresses throughout the program. These tutorials provide students extra conversation practice in Mandarin and guidance with homework assignments, while giving students an opportunity to befriend and be a part of the lives of their Chinese peers. Past students have stated that their peer tutors were one of the favorite aspects of the program. Tutors in Australia can gain a TAFE (Technical and Further Education) certificate in the course Literacy Volunteer Tutoring (Schools) Theory and Fieldwork. Senior students enroll with TAFE and are trained in reading assistance by participating in set modules on theory. At school, the tutors participate in fieldwork by supporting junior students in the reading of the actual classroom texts from their various subjects during Drop Everything and Read sessions on four days per week. The program demonstrates significant success in the full range of government schools including coeducational, girls, boys, central, collegiate and primary schools. The success achieved by Aboriginal students and by boys is particularly significant. The Peer Tutoring Program at Duke University in North Carolina offers up to twelve hours of free tutoring each semester to Duke undergraduates who are in enrolled in select introductory-level courses. Students meet with a tutor weekly in a convenient public location on campus such as an empty classroom, the library, or a dorm common area. All peer tutors receive on-going training both in best current tutoring practices and on tutoring strategies relevant to their tutoring discipline. Despite the continued popularity of college student peer tutoring, there exists little comprehensive research on its effectiveness and benefits. What research does exist, however, has found that peer tutoring is highly cost-effective and usually results in substantial gains for participants, both academically and socially. A reciprocal peer tutoring (RPT) program at California State University, Fullerton has been evaluated extensively. The program requires students in a large introductory psychology course to meet with student partners periodically throughout the course to quiz each other and discuss the main ideas for each unit of the course. Largely a commuter college, the program seeks to increase academic success, as well as to increase the social integration of the students. The program has been highly successful in both respects: when compared to control students who participated in other supplementary activities, RPT participants showed higher academic achievement on unit tests, rated themselves as more satisfied with the class, were better adjusted psychosocially, and frequently used their RPT partner as a supportive resource in the course. Carsrud (1984) describes an example of a surrogate teaching method in which doctoral students supervised undergraduate psychology students in conducting research projects. One of the major goals of this program was to encourage highly motivated and well-prepared students to become interested in pursuing research through skill development and exposure to first-hand experience. The undergraduates worked closely with the graduate students in designing and implementing the research, and were required to produce a professional-style report at the end of the study. The program was considered a success, based on participants’ self-reports. A different type of surrogate teaching program was used in an introductory psychology class at Washington State University. Students were given the choice of attending weekly supplemental discussion sessions led by senior undergraduates or participating as subjects in various research projects within the department. Those who opted for the supplemental discussion sessions were assigned to either a maximal group (six students to one tutor) or a minimal group (twenty students to one tutor). Students who were in the tutoring groups performed significantly better on the class exams than did the control subjects who merely served as research subjects. In early learning institutions, the effectiveness—if not the widespread use— of peer teaching is equally apparent. In one study conducted in an Ohio school in 2011, four sixth grade students of the same reading level engaged in reading passages from the Quality Reading Inventory (QRI). The QRI is an informal assessment instrument containing graded word lists and numerous passages designed to assess a student’s oral reading, silent reading, and comprehension abilities (Leslie & Caldwell, 2006). One pair of students engaged in a peer tutoring activity as they read a passage together, actively discussing and talking about the passage as they read. The students then individually gave a retelling of the story to the investigator. The second pair of students read the same passage separately and individually gave a retelling of the story to the investigator. Each pair of students engaged in this procedure twice a week, resulting in a total of eight times, over the course of four weeks. The students who had engaged in peer learning scored significantly higher on the QRI (Quality Reading Inventory) test than the students who had not, indicating the effectiveness peer tutoring can have on academic achievement. The accuracy of the retellings was examined using the QRI retelling scoring procedure to determine whether there is a relationship between peer tutoring and higher retelling accuracy. The retelling data was scored using the QRI retelling scoring sheet, and retellings were assigned a numeral score. The scores over the four week period were graphed and examined to determine whether there is any relationship between the pair of students engaged in peer tutoring and individually-working students. The students who had engaged in peer learning scored significantly higher on the QRI test than the students who had not, indicating the effectiveness peer tutoring can have on academic achievement. This is just one example; to name them all here would take far more time than you or I have to spare. Despite its popularity, peer teaching has come under considerable scrutiny in recent years, especially in the K-12 community. One blogger writes, “This practice has significant downsides for both parties” and goes on to describe the story of frustrated teachers in Manhattan who created a buddy program, enlisting older students to help teach struggling readers. She cites lack of evidence as a primary concern, mentioning a 2008 National Mathematics Advisory Panel which reviewed instances of instruction in which students were primarily doing the teaching. The panel found only a handful of studies that met its standards for quality. Her primary issue with peer teaching, though, is the return on her investment. “I want expert teachers, not other students, teaching my kids,” she says, referring to the expenses associated with quality schooling. Another blog cites “student hesitancy” as a potential issue. Some students may feel that being tutored by another makes them inferior to that student, setting up an adversarial relationship from the start. If a student develops this feeling of inferiority, he may be less than eager to work with his assigned peer and, as a result, not put his full effort into the tutoring program. The blog also mentions lack of confidentiality, parental concerns, time and scheduling conflicts, and improper tutor selection as possible problems. All valid points, to be sure. But, as is the case with most educational strategies, the boons outweigh the burdens if it is implemented correctly. Below are a few suggestions for employing peer teaching in your own classroom. 1. Be sure your tutors are trained. Existing research identifies adequate tutor training as an essential component of peer tutoring programs. One after-school peer tutoring program implemented in a middle school in California, called Student-2-Student, offers tutoring in a variety of subjects to students with the help of high-achieving eighth graders. Student-2-Student is selective in its recruitment of tutors. Qualified eighth graders meeting a minimum GPA requirement and demonstrating high citizenship must complete an application process and obtain approval from their teachers before being paired with struggling students. The program advisor then matches tutors to students based on who seems to be a good match academically and socially. Tutors receive quality training in effective ways to work with their tutees. This program led to a significant improvement in core subject letter grades for all participants. In an evaluation of the program, participants also demonstrated increased responsibility, completion of homework assignments, and significantly improved work habits. In another peer teaching program, sixth grade students enrolled in general reading education classes in a Midwestern, urban middle school were assigned to tutoring pairs of either equal ability or pairs in which high-achieving students modeled successful learning with lower-achieving students. Similar to Student-2-Student, the students received training prior to tutoring. What sets this peer tutoring program apart from common peer tutoring practices is the inclusion of a reward system for students to encourage participation and on-task behavior. During the sessions, the teacher supervised all activities and passed out raffle tickets to students exhibiting good tutoring or on-task behavior. Students wrote their names on earned tickets and placed them in a collection throughout each week. At the end of each week, the teacher would draw several names of students who could each choose a small prize from a box of inexpensive toys. Evaluation of the class-wide peer tutoring model with rewards for good behavior showed substantial letter grade improvements for the students. The lottery system for reinforcing participation and on-task behavior was show to overcome challenges to student motivation. 3. Emphasize confidentiality, positive reinforcement, and adequate response time. The tutors at Student-2-Student are taught to demonstrate three important things during any given tutoring session: confidentiality, positive reinforcement, and adequate response time when asking questions. The training process also instructed tutors on explaining directions, designing work for extra practice, watching for and correcting mistakes, and providing positive feedback and encouragement. 4. Choose the learning exercise and the appropriate vehicle for it. Simply placing students in groups or pairs and telling them to “work together” is not going to automatically yield results. You must consciously orchestrate the learning exercise and choose the appropriate vehicle for it. Only then will students in fact engage in peer learning and reap the benefits of peer teaching. Buzz Groups: A large group of students is subdivided into smaller groups of 4–5 students to consider the issues surrounding a problem. After about 20 minutes of discussion, one member of each sub-group presents the findings of the sub-group to the whole group. Affinity Groups: Groups of 4–5 students are each assigned particular tasks to work on outside of formal contact time. At the next formal meeting with the teacher, the sub-group, or a group representative, presents the sub-group’s findings to the whole tutorial group. Solution and Critic Groups: One sub-group is assigned a discussion topic for a tutorial and the other groups constitute “critics” who observe, offer comments and evaluate the sub-group’s presentation. “Teach-Write-Discuss”: At the end of a unit of instruction, students have to answer short questions and justify their answers. After working on the questions individually, students compare their answers with each other’s. A whole-class discussion subsequently examines the array of answers that still seem justifiable and the reasons for their validity. 6. Use role playing and modeling. During the first week of the sixth grade reading program, project staff explained the tutoring procedures and the lottery, modeled each component of the program, and used role-playing to effectively demonstrate ways to praise and correct their peers. 7. Emphasize the importance of active learning. Many institutions of learning now promote instructional methods involving “active” learning that present opportunities for students to formulate their own questions, discuss issues, explain their viewpoints, and engage in cooperative learning by working in teams on problems and projects. Critique sessions, role-play, debates, case studies and integrated projects are other exciting and effective teaching strategies that stir students’ enthusiasm and encourage peer learning. To reap the benefits of peer teaching, tutees must reach a point when they are practicing a new task on their own. Tutors can help prepare students for independent demonstration by providing instructional scaffolding, a method by which the tutor gradually reduces her influence on a tutee’s comprehension. See our guide on instructional scaffolding here for further explanation. 9. Explain directive versus nondirective tutoring. A tutor who engages in directive tutoring becomes a surrogate teacher, taking the role of an authority and imparting knowledge. The tutor who takes the non-directive approach is more of a facilitator, helping the student draw out the knowledge he already possesses. Under the directive approach, the tutor imparts knowledge on the tutee and explains or tells the tutee what he should think about a given topic. Under the non-directive approach, the tutor draws knowledge out of the tutee, asking open-ended questions to help the student come to his own conclusions about the topic. Both are valid methods, but different levels of each should be used with different students and in different scenarios. 10. Explain how to provide feedback. Positive verbal feedback: Teach your tutors the importance of positive verbal feedback. Prompt students to come up with a list of standard statements which they feel may be positively reinforcing. They also need to be taught how much positive feedback to give. Giving feedback after each and every response can take too much time and diminish its effect. Teach tutors to give genuine praise after every third or fourth correct response and after particularly difficult problems. Make sure to have them practice. Corrective feedback: Teach your tutors how to respond when an incorrect answer is given. When an incorrect answer is given, the tutor should promptly give and explain the correct answer or draw the correct answer out of the tutee without being critical of the tutee, and then give the tutee an opportunity to repeat the correct answer. Please check out PLTL : Peer led Team Learning which is a model of peer assisted learning developed ay the City College of New York for STEM courses. We have collected substantial data from implementations of PLTL that demonstrates improved student grades with PLTL courses. Main resource PLTL: A Guidebook Prentice Hall. All your prior learning that you acquired during your lifetime can be converted into academic document with http://www.lifeexperiencedegreecampus.com/prior-learning/ which can eventually help your career grow in all dynamics. I loved the tips! Good job! Great well-researched article. The pro’s definitely seem to outweigh the cons and I really liked the quote from Jeff Atwood. I’m using a similar method for helping entrepreneurs learn the business skills they need by connecting them together in virtual mastermind groups and showing them that their peers are often the best source of advice and support. The article is very helpful.Could you please substantiate on this point’Teachers receive more time to focus on the next lesson’. Could you please contact me as we would like permission to use an extarct from this blog in a forthcoming book. Can anyone suggest quick learning exercise for poor learners to include in peer learning program for undergraduate students. Hello Saga, It’s great article for teachers to improve student learning.